The Sopranos: "Whoever Did This"
In which Tony Soprano avenges a horse. If you’ve ever seen The Sopranos ever, you know “Whoever Did This,” and you can probably provide a rough plot summary. It’s the one where Pie-O-My has to be put down, due to burns suffered in a stable fire, prompting Tony into a rage that ends up with him killing Ralphie. He then has to recruit Christopher to help him cover up the murder. You also probably remember that Ralphie’s bald head goes into a bowling bag. 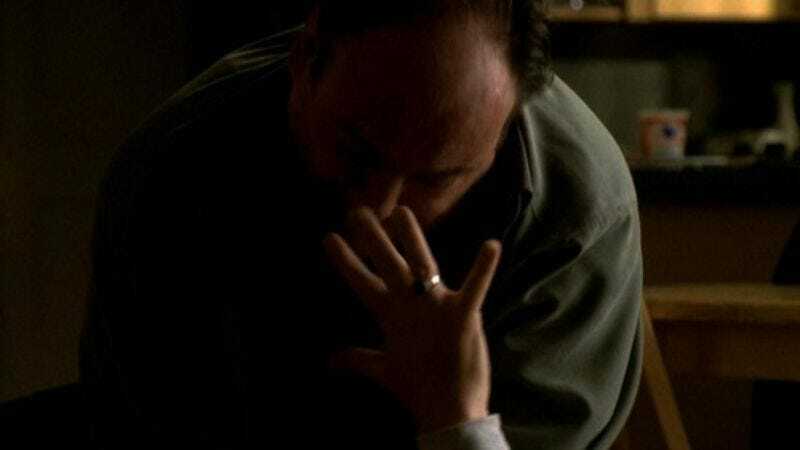 “Whoever Did This” is one of the best episodes The Sopranos ever did, made all the better by all of the work that went into simultaneously preparing us for this moment and into blindsiding us with how out of nowhere it seems to come. The episode makes callbacks to all four seasons of The Sopranos so far, but most poignantly to season three’s “University.” It’s a series highpoint, one of those episodes that instantly comes up whenever anyone talks about the series. Here’s the thing, though: The Pie-O-My news comes around the 30 minute mark. Much of the first half of the episode is taken up by dueling plotlines about Uncle Junior getting hit in the head with a boom microphone and taking a tumble down the courthouse stairs and Ralphie’s son Justin, a character we’ve barely met before, getting shot in the chest with an arrow, which lands him in the hospital. The stuff everybody remembers about this episode? It comes in the back half of the episode entirely and happens both so quickly and so logically that it proceeds with the relentless sense of a nightmare. One moment, Ralphie and Tony are talking about whether Justin will get better or not, and the next, Ralphie’s a corpse on the floor. That fight, which feels like it goes on forever, so excruciating to watch is it, doesn’t even go on for five minutes. There’s far more time given over to the more procedural storyline of Tony and Chris figuring out a way to clean up after Tony’s crime (a crime he insists he had nothing to do with to Chris, who seems to just barely believe him). Ralphie’s death, like most violent deaths, is a quick before and after. And one of the things that makes “Whoever Did This” work so well is that unexpected structure, both in the episode and, even more importantly, in the season itself. We’ve spent nine whole episodes without significant mob violence. In the premiere, Chris killed the police officer he believes to have killed his father, thanks to what Tony tells him. But since then, the biggest fight we’ve had has come between Artie and a random French dude we never see again. Every time we’re about to see violence, the camera cuts away. And every time it seems like we’re going to get something action-packed, we instead cut to Melfi in the therapist’s office with Kupferberg or something. This season immensely frustrated fans at the time of airing, and now that I’m going through it one episode at a time, I can sort of sympathize all over again (though since I knew this was coming, it was easier to be patient). The structure bringing us to that confrontation in Ralphie’s kitchen is impeccable, but only once you know the payoff is coming. You’ve gotta have faith, and the show’s writers were always happy to laugh at the faith the audience placed in them. But the episode itself has an unexpected structure, too. Junior faking Alzheimer’s in order to avoid prosecution is the sort of broad comedy the show often screwed up with the old man (though I think it’s pretty funny here), and it feels about as far away from the last half of the episode as anything could get. When Junior’s adventures briefly intrude on what Tony and Chris are up to toward the end of the episode, it feels as if it’s dropped in from another episode entirely, and in a way, it has. The first half of this episode is about as far removed from the second half as it can get. The major concern of that first half is just what will happen to Justin, who’s still in the hospital as the episode ends, but it’s not as if Tony really cares. He kills a man because he thinks he killed a horse, and everything after that is a sickly fascinating look at how the body is disposed of so no one’s the wiser. I’ll repeat myself: Ralphie’s son is in the hospital after taking an arrow to the chest, but we end up being asked to be far more interested in whether Tony can clean up the crime scene. It’s just the latest of the show’s many attempts to see just how far it can push us for watching this show and these characters, and it’s a pretty great structural trick all the same. One of the best things about “Whoever Did This” is all of the ambiguity it builds around the death of Ralphie. It’s not the kind of ambiguity where we wonder if Tony will ever be caught for this crime, since we’re pretty certain he’s done a good job of cleaning up the scene and we also have a good idea that Chris will never rat on his uncle, no matter how much he might suspect what really happened. In particular, the episode is built around three rich questions that draw on everything we know about these characters and about the world they live in. Let’s tackle those three questions in the order they’re raised and plumb the depths of the show’s metaphors. Did Ralphie set the stable fire? Remember: The opening half of the episode seems to be built around the idea that Ralphie is going to try to be a better person, at least insofar as he can do so while remaining a member of the Soprano organization. Is this all clever misdirection designed to make Ralphie’s burning of the stables that much more shocking? Or is it a genuine change (at least one embarked on for a little while), a change that nonetheless dooms Ralphie because of what he’s done in the past? There’s a moment in the scene in Ralphie’s kitchen where Tony goes from just poking at Ralphie, trying to get him to admit that he set the stable fire (and not very subtly) to blatantly accusing him of doing so, and what’s intriguing about the set-up is that this ends up being just as much about Tony talking himself into believing in a scenario where Ralphie set the fire as anything else. There’s a very particular turn, when Tony mentions the guy who helped Sil set the restaurant fire back in season one, and in that turn, you see Tony creating a scenario that will give him the justifications to do what he does next. And yet we know Ralphie well enough by now to know that this is totally something he would do and something he would get away with, too. He’s facing a certain amount of expenses due to Justin being in the hospital, and the visit from his ex-wife is a reminder of just how boxed in he is on the domestic front. Ralphie’s got motive, and Tony’s right. He knows the right people to get the job done, if he really wants to set fire to the stables and collect on the insurance money. Furthermore, where James Gandolfini plays the scene with a growing certainty, Joe Pantoliano is very cagey about just what Ralphie knows and just what he’s going to admit to. Every time I watch this scene, I go back and forth about whether Ralphie set the fire or not, and I’m always impressed by how the show finds a way to set up the situation so Tony seems even more monstrous than usual, not even terribly concerned about Justin when Pie-O-My has died. In the early scenes where Tony tries to comfort Ralphie, he seems ill at ease and uncertain. But when he sees the corpse of Pie-O-My, he’s both able to grieve and able to take revenge for what he believes happened. Just how much does Christopher know or suspect? It’s obvious that Christopher suspects Tony to a degree and perhaps even knows exactly what went down but also knows he can’t say anything. At the same time, he’s not going to say anything bad about his uncle, and if his uncle asks him to willfully ignore something suspicious, well, Chris is the right kind of guy to ignore whatever Tony needs ignored. The moment in the kitchen when Chris first arrives seems to suggest he’s put it all together, but he’s also high, and he clearly doesn’t quite trust his thought processes. And for an episode that began as one about the relationship between Tony and Ralphie, it ends as one about the relationship between Tony and Chris, with the two’s excursion into the wilds of New Jersey to get rid of the body ending up as a chance for some bonding and a chance for Tony to tell Chris to give up on drugs, since they’ll only destroy his life. And it’s in the midst of this that Chris starts to believe his uncle’s wildly improbable story that he just happened upon Ralphie laying in the middle of the kitchen floor like that, that it was too late for an ambulance. Well, he doesn’t really BELIEVE it, so much as he decides to go along with it because of his relationship with Tony. And yet the show leaves this bit of information there, a bit of information that will always be in the subtext between these two from now on. But the central question of “Whoever Did This” is right there in the title. Tony’s the one who says it, referring obliquely to the person who killed Ralphie, even though we know who killed Ralphie. We’ve seen Tony be violent before, but we’ve never seen him quite like this. Up until now, it would be easy to suggest he was a bad guy yet still somehow likable. But now that we’ve seen him at his most nasty—no matter who he was avenging—now that we’ve seen him stuck in a gutter fight he only barely escapes from (Ralphie’s use of the Raid is a nice touch), we know a side of him we haven’t seen this clearly before. Tony refers to “whoever did this” because in some ways, the switch that flips in him is as distinct as the switch that flips in the episode itself. The episode ends with him leaving the darkened Bing, heading out into blinding daylight, and as he’s burned from our vision into the credits, it’s hard not to think that we’ve never really seen him clearly. Another critic wants me to discuss whether or not Tony versus Ralphie is a fair fight, so I think I shall. Here’s what I’ll say: Tony’s obviously got a pretty massive size advantage on Ralphie, but Ralphie’s playing on his home field and is craftier. I’d still give the edge to Tony, but I think the show does a good job of leveling the playing field. I didn’t really discuss just how brutally choreographed the fight scene is. It really does feel like just about anything could happen, and when Ralphie picks up the knife, it’s easy to imagine things having a very different end, even though we intellectually know there’s no show without Tony. A lot of the unexpectedness stems from the fact that there’s nothing pretty about how the fight is choreographed, and that makes the scene even more visceral. Wikipedia points out that the song “Sympathy For The Devil” is quoted thrice in this episode. I’m not sure what that’s supposed to mean, but it’s something, I guess. Junior’s Alzheimer’s routine is pretty great. The show would too often use Dominic Chianese for goofy comic relief in its later years, but he was always good at playing that sort of thing. I also love that he gets hit in the head because he turns to talk to the pretty reporter he recognizes the name of. And the scene where he stands alone in the living room and seems confused is a heartbreaker. Ralphie’s prank call to Paulie’s mother briefly offers up the idea that Chris might think Paulie killed Ralphie. But no. Paulie’s off somewhere else, which makes this another intriguing loose end. Tony knows how to use the backhoe because when he was a young teenager, his grandfather let him run loose at construction sites. How nice. I love the scene where Chris walks right up to asking Tony if he did it by suggesting other guys could worry they don’t have the protection of the boss, now that Ralphie’s dead, and Tony points out, bluntly, that Chris is the only other person who knows about Ralphie’s death. Another fun motif that’s becoming easy to pick up on: Ralphie’s preparing eggs, the official food of death in Sopranos-land. At least the goat survives the stable fire. I don’t know what I would have done if the goat had died. The great growing rift in the Sopranos marriage takes a break this week, as Carmela mainly comforts Ralphie and meets Pie-O-My, whom she seems quite taken with. I had forgotten the Junior dementia plotline starts this abruptly. It seems appropriate that it does, since the episodes where Tony wanders through Purgatory after Junior shoots him have some intriguing thematic links to this one. It’s also worth pointing out that this episode ties in nicely to “Kennedy And Heidi,” in which Tony kills the man he thought would be his successor. Genuine question: Is the farm Tony and Chris go to also the farm where Tony Blundetto hides out? Or am I misremembering that?